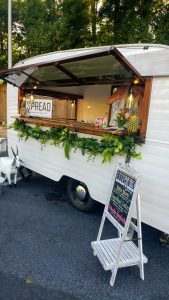 I’m so excited to introduce the Tipsy Gypsy Caravan, dear readers– this is my best friend Cami Bell’s business dream and it has come to reality all because of her amazing vision and talent for entertaining. The Tipsy Gypsy is a mobile bar, and she’s currently operating in the Raleigh, NC area. Contact information can be found at here. 1.What IS a mobile bar exactly…and what are the advantages to throwing a party or event with one? 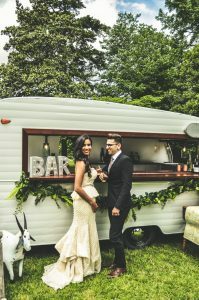 A mobile bar is a camper converted to a highly functional bar for serving beverages at any event – wedding, birthday party, customer service event, convention, pig pickin’ – wherever friends, family or customers are gathered. It takes your event to the next level. The hospitality industry has done so much with food service for events, but has painfully ignored the beverage service. 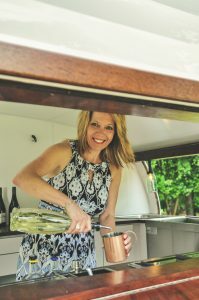 Instead of the tired old table with a white linen table cloth and a guy with a bow-tie serving drinks, the beautiful design and woodworking detail of the caravan, itself, becomes a center piece, and the bartenders are dressed to fit the occasion. The drinks become an integral part of the service instead of an afterthought. No more well liquor and soda. We serve 3 custom craft cocktails, made with our own syrups and juices, created specifically to pair with the food and theme of the event. The wine and beer selection is also carefully chosen to pair as well. The fixed drink menu has a few advantages. It keeps the costs down and saves all the half used bottles of liquor the host has to deal with after. Additionally, it allows the service line to move more quickly since the choices are fewer. And finally, the thought that goes into these cocktails adds a special touch for the guests. They know the host has put thought into the beverage service. No muss, no fuss. We roll in, set up, serve, clean up and roll away – no footprint left behind. It’s just plain fun! The guests love the caravan itself, peering inside and asking questions. The drink menu becomes a topic of discussion between the guests each inquiring about what the other has tried. Esmeralda, The Tipsy Gypsy Caravan, makes a distinct impression and your guests will be talking about your event for years to come. What was your inspiration for the Tipsy Gypsy caravan? Cami: I attended a clam bake in Hudson, Ohio and a similar caravan was serving the event. I was blown away by the concept. I did some research and decided my new home town of Raleigh needed this badly. What is your philosophy around great events? Cami: It’s all in the details. I’ve been throwing my own parties for years and it comes down to planning, preparation, staffing and fun. What happens when you contract with someone for a party? What is your role? 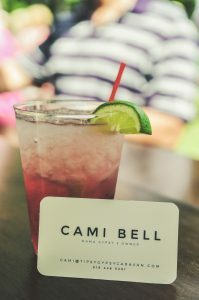 Cami: After we have an understanding of the theme and the food, we create 6 cocktails and provide a tasting for the friends and family of the host. Once the selection is complete, we provide a detailed spreadsheet of the liquor, beer and wine to purchase. Fortunately, I have some great relationships with local wine stores and breweries so discounts are available to our customers. We set a timeline for purchase and pick up so juices, syrups, garnishes and batch drinks can all be created in the days leading up to the event. We provide the ice and plastic drink ware and all utensils needed to serve. What can people expect when you arrive? Cami: We arrive 2 hours before the event to set up. We don’t need electricity or water – all are self contained within the caravan. We decorate for the theme and setting up the bar takes some time. We want to be sure everything is perfect before the first guest arrives. After the event is over, we clean up and roll out. Cami: Bringing Esmeralda to life and sharing in the celebratory life experiences of others has been an unbelievable joy. I hope to continue for many years and add new caravans to the fleet. Fantastic and fun, plus creative! Congratulations and good luck on your new endeavor!! 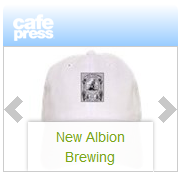 Love ya, Mom M.
Next post: New Albion Ale to be Released in Cans! Plus HOMAGE tee!